Two bailouts and a debt to GDP ratio amounting at 177%. The Greek debt crisis, which officially initiated the European sovereign debt crisis in late 2009 / beginning of 2010, is still far from a solution, after more than five years. Two bailout programs and the implementation of various austerity measures, did not succeed in reducing Athens’ debt to GDP ratio. A new debt crisis is still ongoing, confirming that without the implementation of a robust long term solution able to restore the Greek sovereign debt sustainability and to boost economic growth, these crunches would represent a recurring scenario. What can be done then to turn the illusion of debt sustainability into reality? 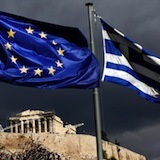 International institutions and top-class economists have proposed various economic recipes to restore the sustainability of the Greek sovereign debt and to tackle its dramatic economic and social situation, but it seems that the experts’ standard tools are not enough or, at least, they are not working as fast as required. In this brief Commentary, Action Institute explains the reasons behind recurring Greek debt crunches and proposes an actionable solution to reverse the trend: overcome the current impasse and avoid future ones.